It's here!! Finally Spring has sprung and in a big way!!! With all the warm weather we have had and the expected 70's for today, how could I not be in Spring mode? This year I also have been inspired by yellow for the spring. 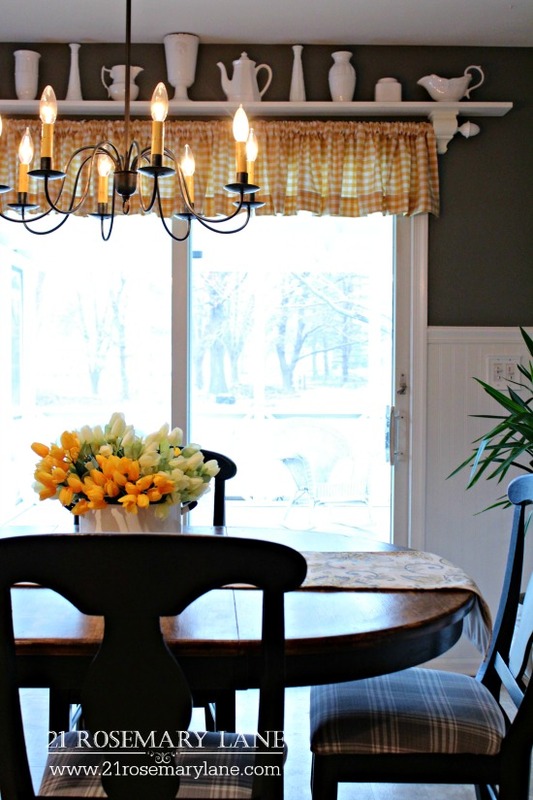 Not sure if it is something I have keyed into through the blogosphere or just my inner designer being pulled toward the bright sunny color, but yellow is now everywhere throughout our home! 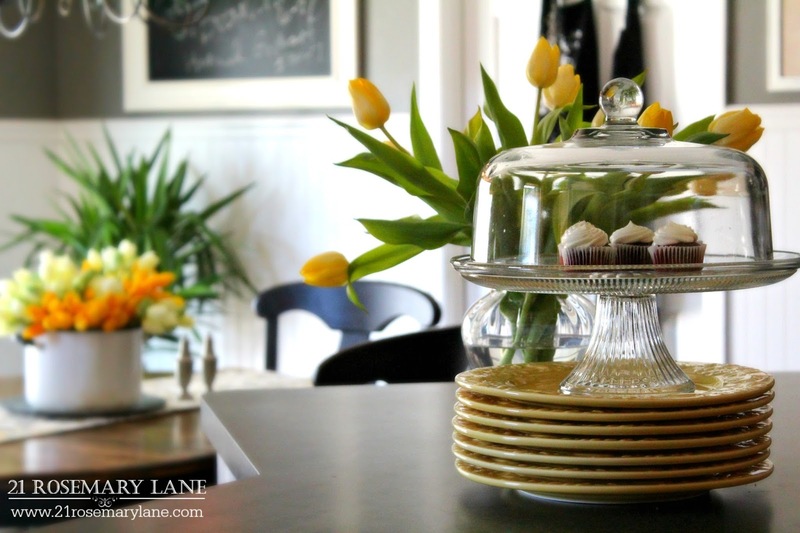 First I want to thank one of the sweetest and most elegant ladies of blogging, my friend Marty from the wonderful blog A Stroll Thru Life , for putting together this amazing 5 day 30 blog home tours. If you are joining me from the lovely blog Monica Wants It welcome. I hope you are enjoying today's home tours. There is a lot of inspiration to be found on these tours...I know that I have been constantly blown away by all the talent! If you are here for the first time let me tell you a little bit about myself and my style of decorating. I am a mom raising two kids, one rambunctious 11 year old boy Michael, and a 13 year old tomboy daughter Grace. I am also the wife of one big kid and avid DIYer Mr. Rosemary Lane, not to mention a mom to our two furbabies, Moe the cat and our big giant doggie Buster. Needless to say life here on Rosemary Lane is never dull. My style is pretty much "whatever I can find cheap or free" and incorporate it with things from both mine and my husband's childhood, which brings an essence of nostalgia to our home. Nothing goes to waste and everything has a purpose, which sometimes means I can end up with quite the eclectic mix. So without further ado...on with the tour! First up our front entry and living room. I have played around with the entry space since we moved into our mid century cape 13 1/2 years ago. I finally found a look I liked using this second hand buffet we purchased from a neighbor who was moving out of state. 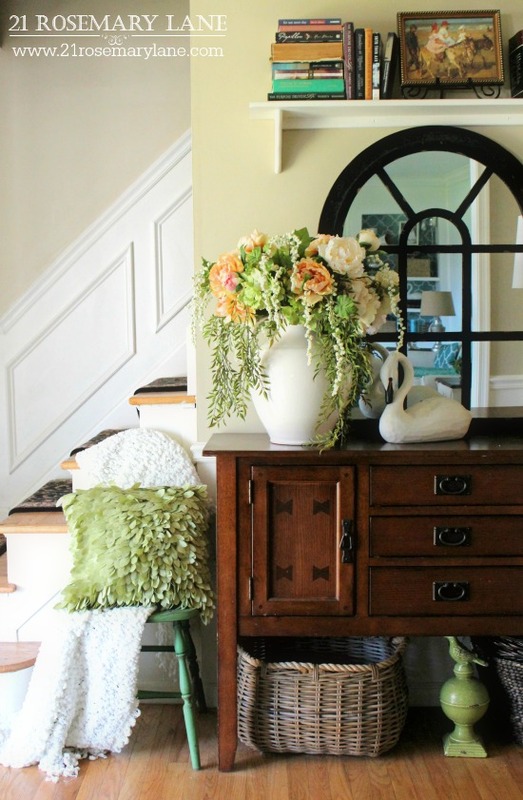 The giant pitcher from Home Goods contains a bunch of lovely faux florals from Hobby Lobby. The pretty arched mirror is an inexpensive find from the Christmas Tree Shoppe last year. An old wooden shelf was placed above the mirror to display some of our favorite books. As you will notice as the tour goes on, I am a big fan of florals, both faux and real. 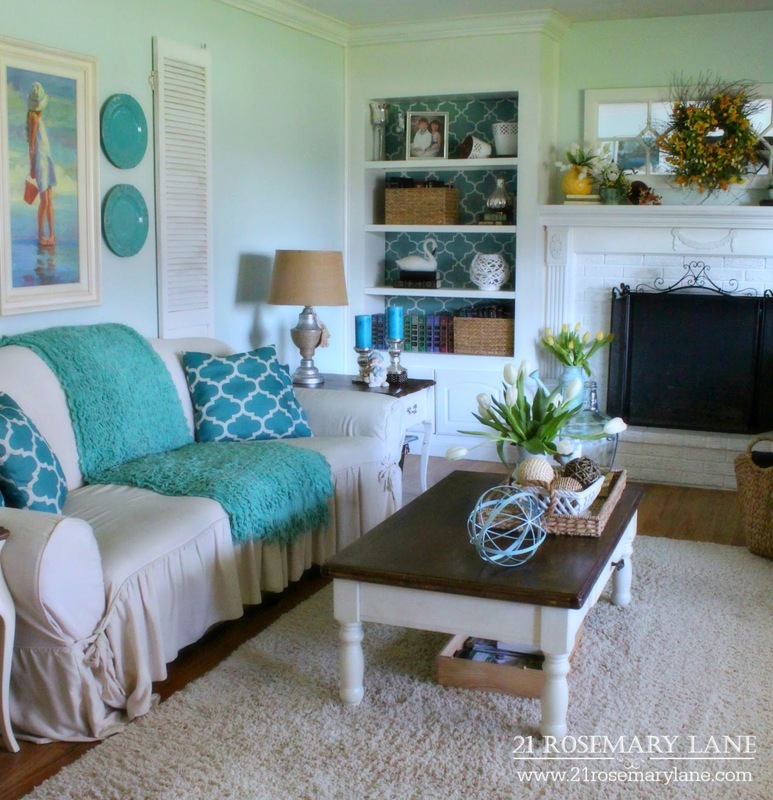 The living room features Mr. Rosemary Lane's handywork. 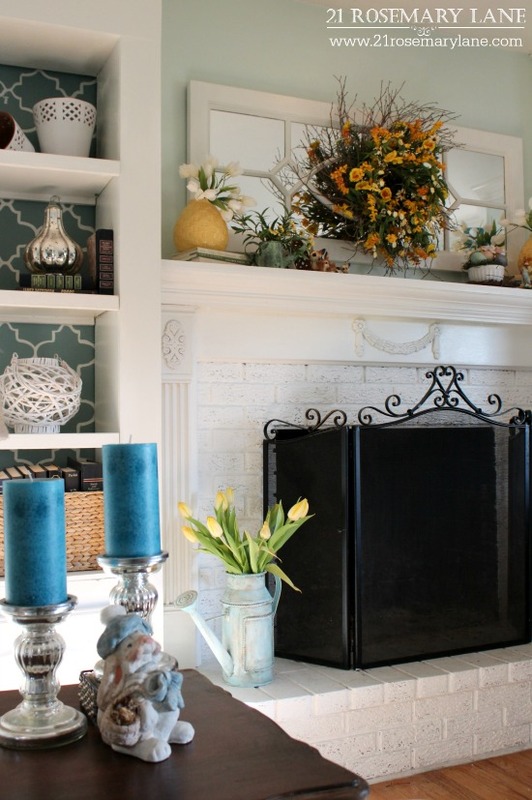 He built the bookshelves and created a custom fireplace mantel and surround. Last fall I took the plunge and painted the red brick of the fireplace white. No regrets! Lots of yellow adorning the surfaces in the living room. 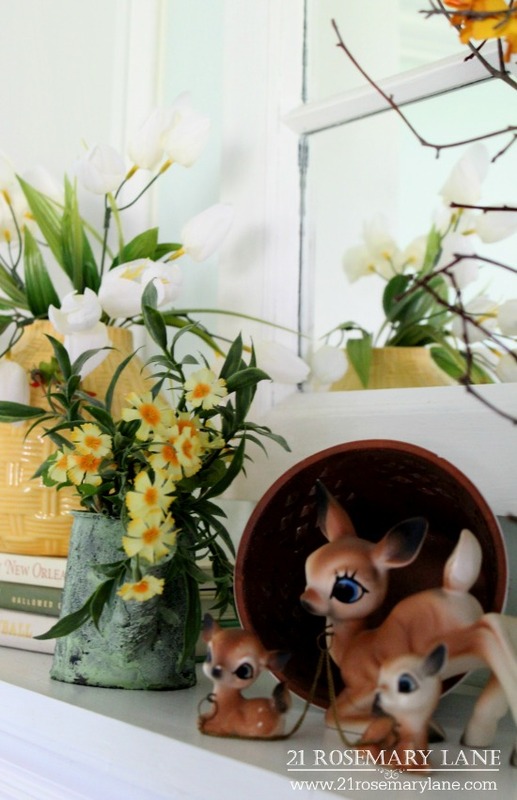 On the mantel is a ceramic deer trio I bought for my mom as a mother's day gift over 40 years ago. The little hutch in the living room was given to me by my sweet friend Colene a couple summers ago. She acquired it from a family member but had no place for the piece in her home, so I got a lovely gift providing me with what every home needs...extra storage! The coffee table and end tables were yard sale casualties a number of years ago. A little sanding, some paint and Minwax and I have my somewhat matched set of living room tables. This next room is our kitchen and I am sooooo excited about sharing it with you all. The week after Thanksgiving we started work on this space to give it a much needed update look. ...and here is how it looks now! 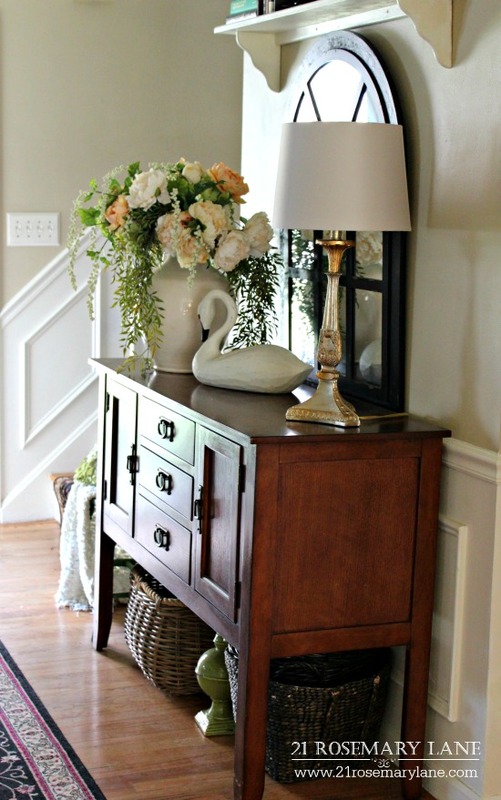 The hutch was a ReStore score last spring for only $40. A little black paint brought her up to the minute. 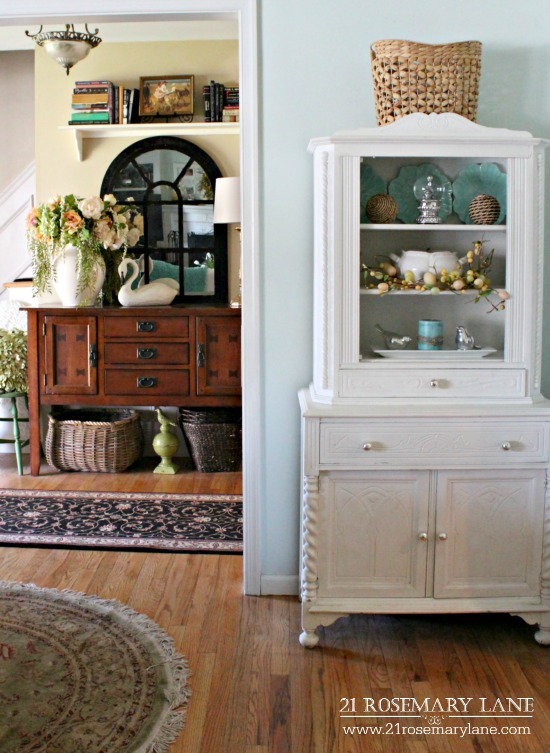 I have to say that this hutch is one of my favorite furniture redoes. 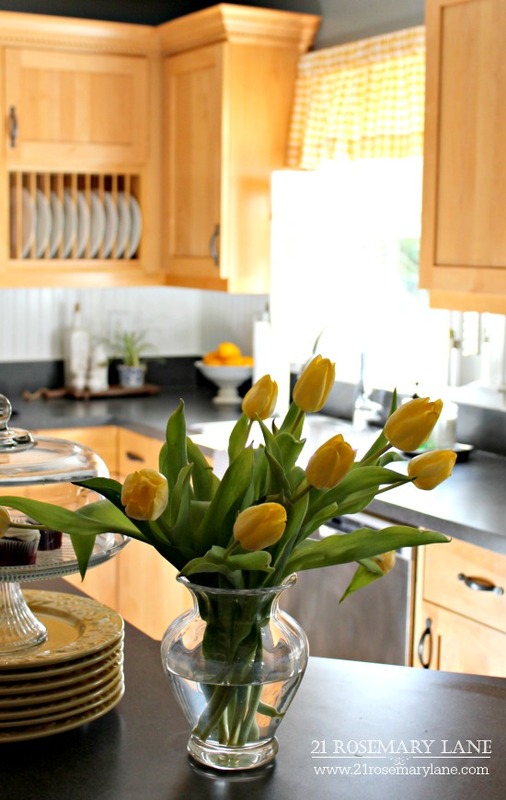 Lots of yellow helps to brighten up the kitchen for Spring. Right before Christmas we painted and added bead board to the kitchen walls. The color is Chelsea Gray by Benjamin Moore. I think it works really well with our honey colored cabinets. I love my new light fixture over the kitchen table which happens to be another ReStore score for a mere $15. Above the back slider is a shelf Mr. Rosemary Lane fashioned a few years ago from two drapery rod holders and a 1 X 4 inch piece of pre-painted wood from Home Depot. Now the white ceramic pieces add some drama to the shelf instead of blending in like they did before. The checked curtains are new and I did go a little over budget on them paying full price over at Country Curtains. But hey a girl has got to splurge once in a while right? 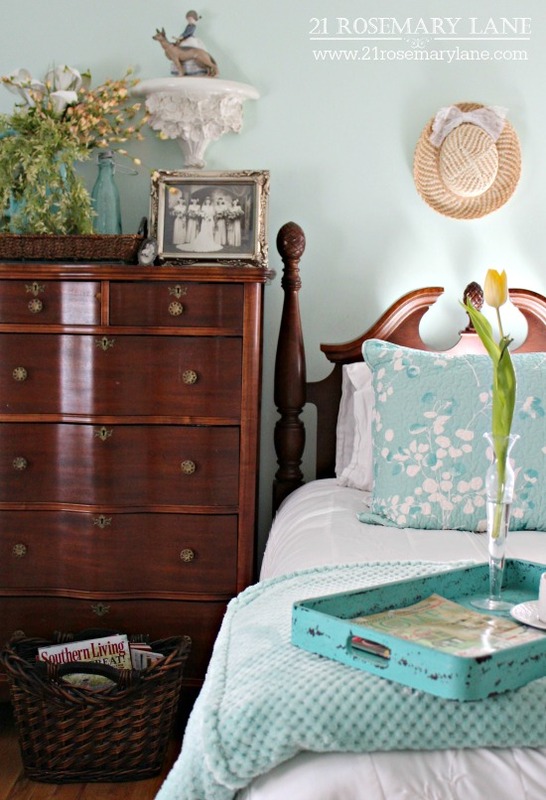 The guest bedroom was "springified" with plenty of florals and light, breezy straw hats. 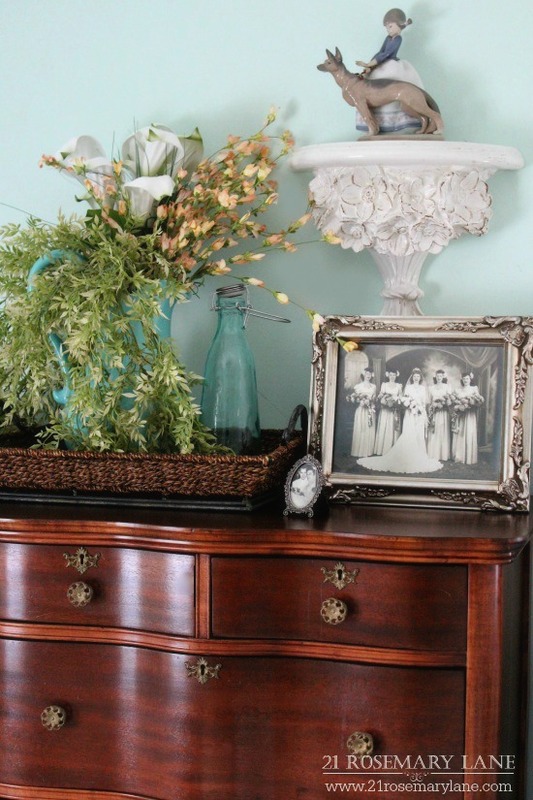 The beautiful gentleman's dressers belonged to my mother-in-law when she was a little girl. It is made of poplar and mahogany with a serpentine front. According to the antique dealer who refinished this piece it dates back to the mid 1800's. On top of the dresser is a wedding picture dating back to the late 1940's of my aunt with all of her sisters, including my mother, as bridesmaids. 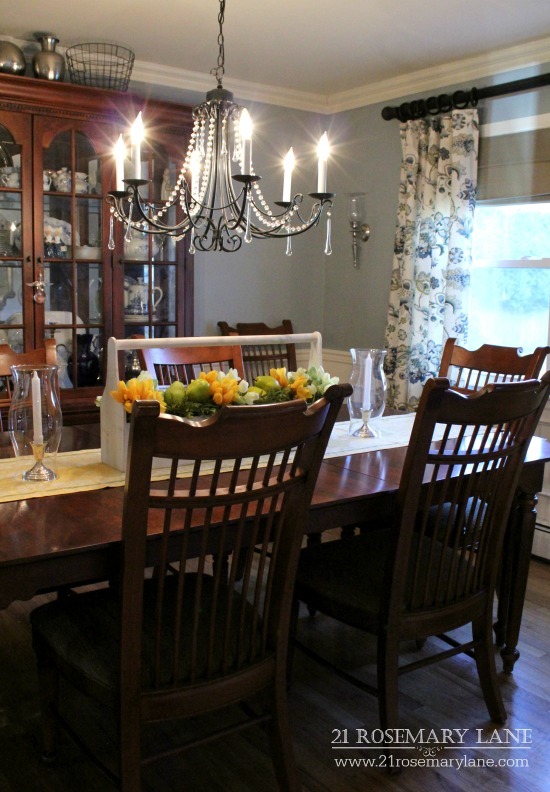 A splash of yellow on the dining room table completes the tour. I am so thrilled that you stopped by for a little visit. I truly hope you will not be a stranger and drop in on me from time to time...the door is always open! 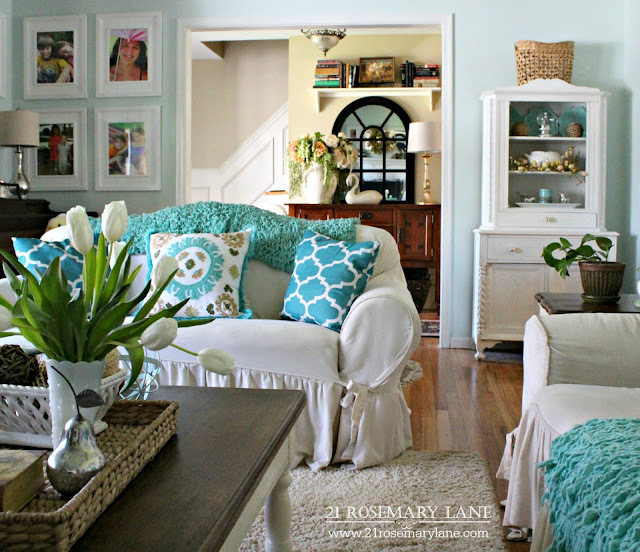 Tomorrow is the 4th day of Marty's Spring Home Tours and it will continue starting with Jennifer from the beautiful blog Decorating Delirium. And to make sure not to miss any of the tours, here is this week's full schedule! 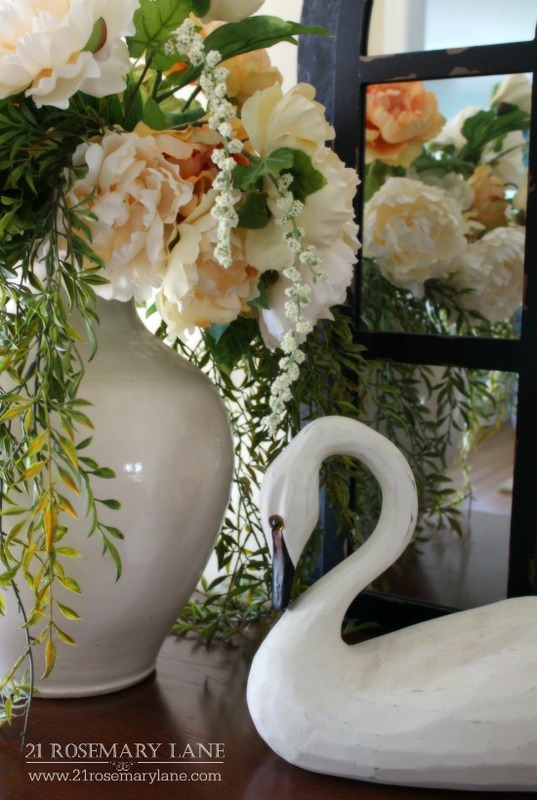 Love all the floral arrangements for spring! Wow - your kitchen changes are huge! Love the new look and that beautiful hutch! And your front door dec is adorable!! Barbara, everything looks amazing! 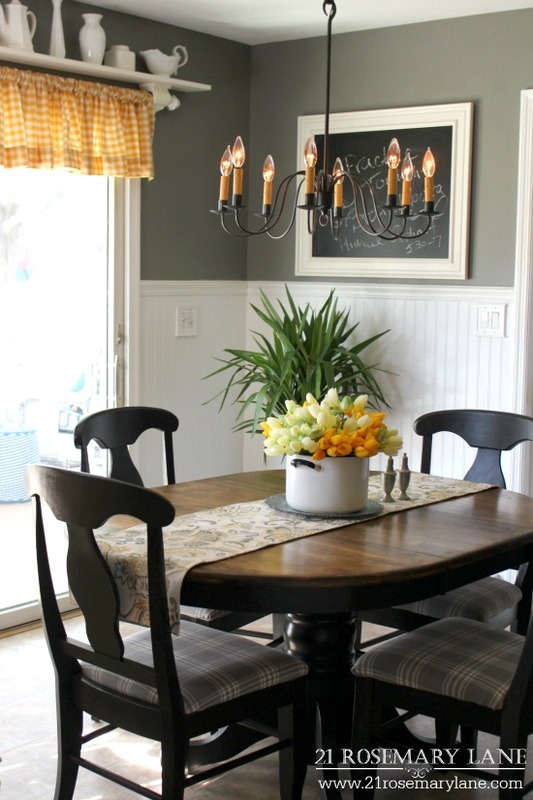 Your kitchen turned out wonderfully with the new colors and that beadboard. I love the paint on the hutch and you are right, it's all "up to the minute" now. 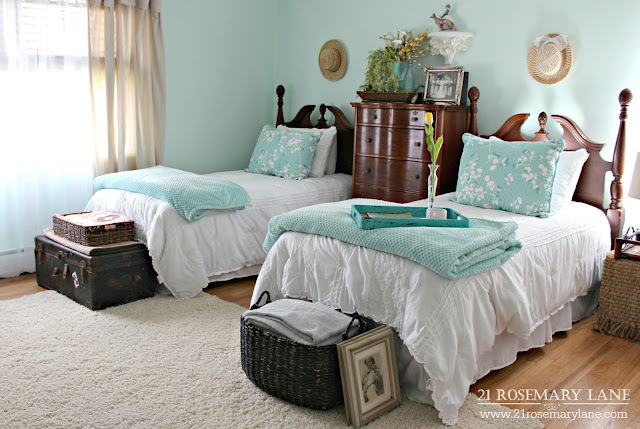 The guest room is gorgeous and makes me realize I need to add a few layers to ours. Still loving the blue you've added in the family room. Barbara your home feels SO fresh! I can't believe you found that gorgeous swan at a thrift store. Lucky duck, err swan. Have an enchanting Easter. Barbara, I love your home and your style. 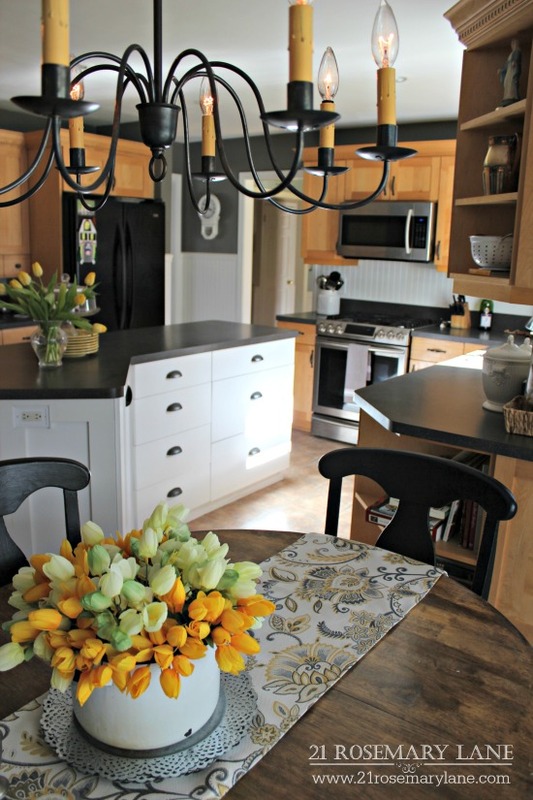 Your yellow is perfect and your new kitchen makeover is stunning. Love the board and batten, plus the wall color is perfect. 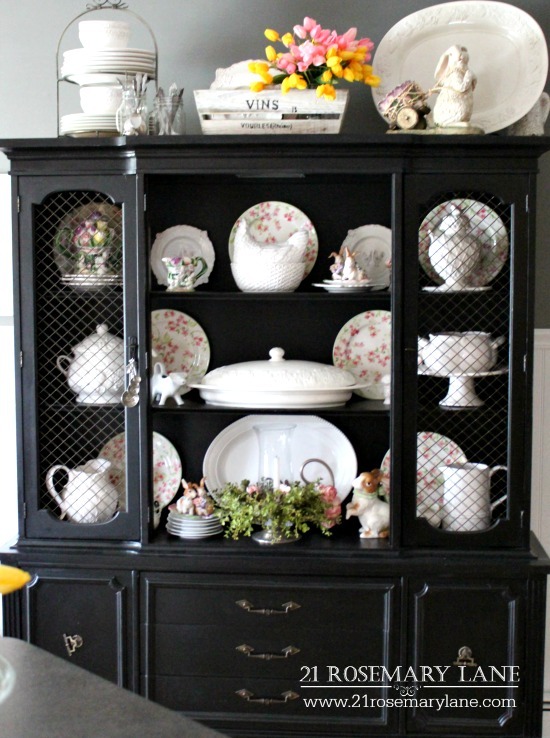 That black hutch looks amazing, what a fabulous find and redo. Thanks so much for joining the tour, it is always such a treat to see your home. 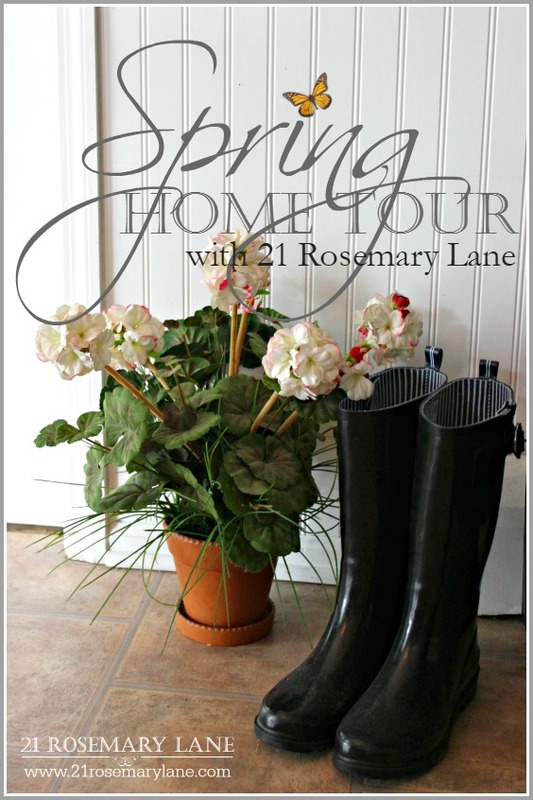 Your house looks lovely for Spring with all your floral arrangements. Your kitchen reveal is awesome! Enjoy it. Your home is just lovely Barbara. I especially loved your entryway and guest room. 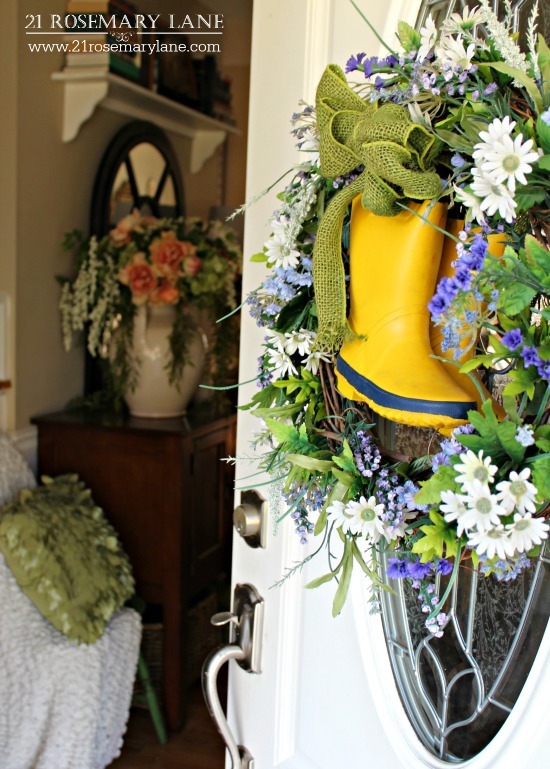 I can't believe the flowers in your entry are faux! I might just have to run out to Hobby Lobby right now. Loved every inch of your tour! I've gone on a lot of the spring tours and to date, YOURS is my favourite! I love your style and the way you decorate your home is terrific. 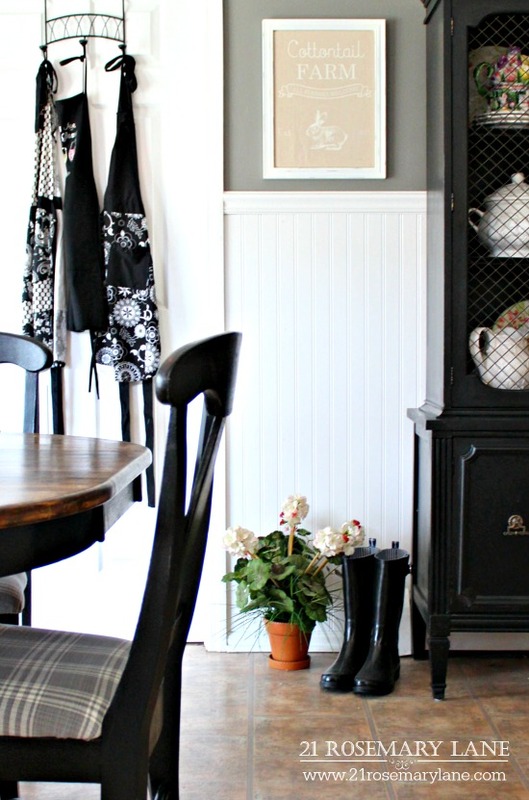 Great kitchen makeover - lovely gray walls and beadboard. 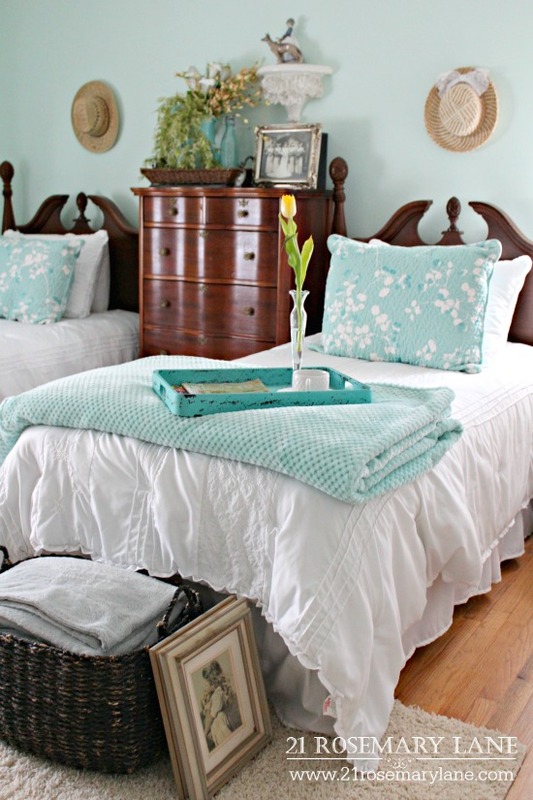 The teal colours in your living room and bedroom are fantastic. I would stay any time in your guess bedroom! :) So airy and comfortable. 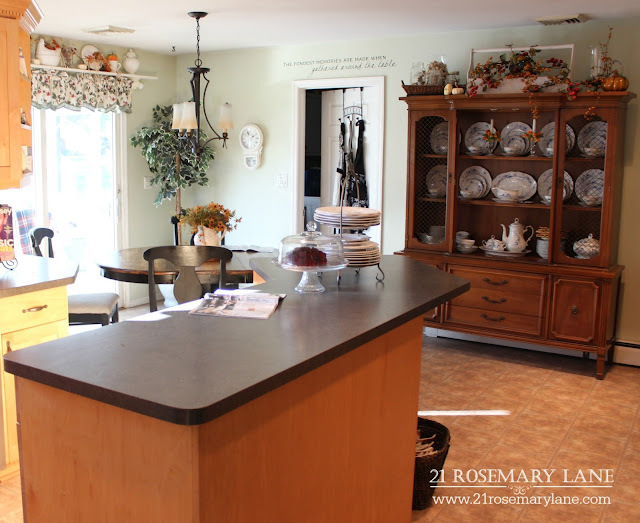 Love your home, and of course I love the changes you gave to your kitchen, beautiful! of your Kitchen and other rooms within your home, dear friend! I, also, enjoyed getting to know a bit more about you and your family! Your Entry is what drew me to 21 Rosemary Lane a few years ago! I love that furniture piece and the mirror! 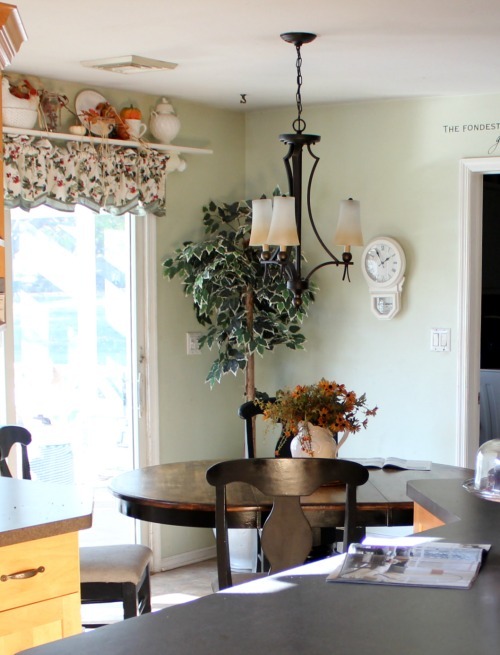 Your Kitchen make~over is such an amazing transformation! has made me more determined to change mine. . .hopefully this year! Hi Barbara, what a lovely tour! Your home is so well put together and so cozy and welcoming. Loved all of your ideas! So Beautiful, Barbara! The kitchen transformation is gorgeous. 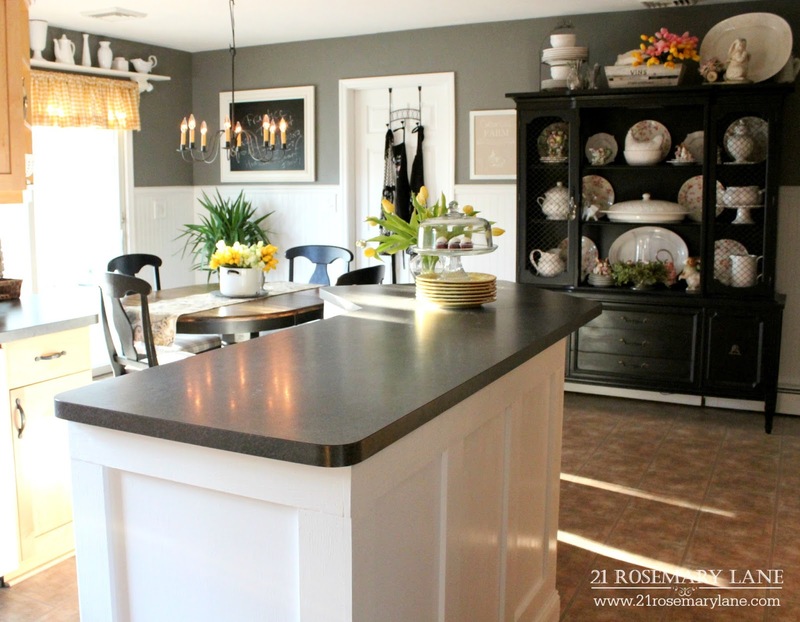 Your kitchen transformation is stunning! Your home is so amazingly beautiful! The kitchen is lovely and that hutch...WOW! Your home is lovely. That black hutch, though! Now that is a real eye catcher! I love the color contrast and how you used pink so beautifully in there. Barbara, I am so glad I saw this on your sidebar and didn't miss the tour. I have a hutch in my breakfast room that Joe made. I have been debating abut painting it black! After seeing yours I am convinced, now all I have to do is convince HIM!! :):) Your home looks just beautiful!!! 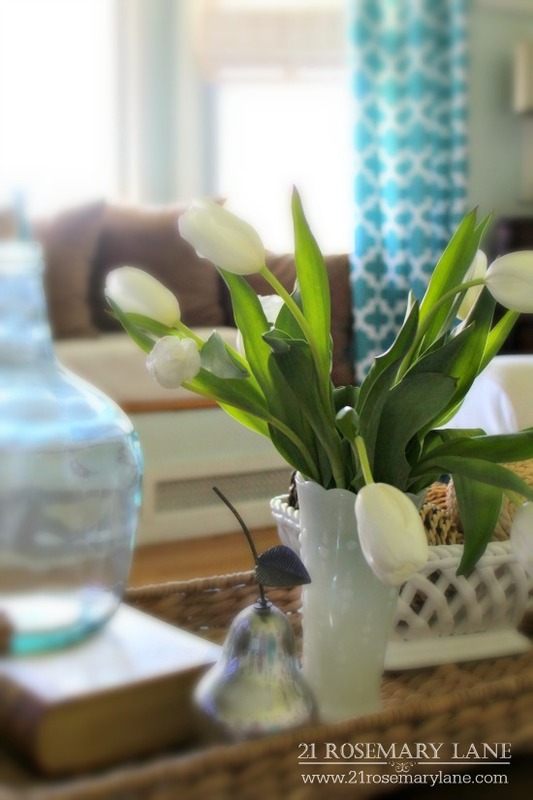 During spring we can do some kind of experiment with our home design, most probably in every season, we make some change in our home interior to make our home season friendly. Home design ideas are quite essential for every homeowner as it brings some suitable changes in our home condition. From here, we learn some basic things about home design and how to make our home condition better. Thanks for such a wonderful article with useful design tips. Thank you for writing this useful content. Your kitchen really looks awesome. I just want to share about, as a blogger I was looking for best wordpress hosting for beginners and found a very good option. This is a good hosting to start a blog in 2018. Your kitchen really looks awesome. Thank you for writing this useful content. Amazing kitchen, pics are awesome. I loved the article.